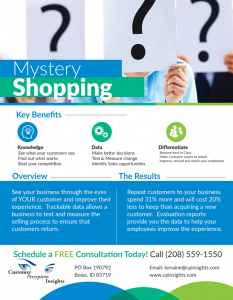 See your business through the eyes of YOUR customer and improve their experience. Trackable data allows a business to test and measure the selling process to ensure that customers return.As a Business Owner you need new customers to grow but NOT knowing how the competition attracts YOUR customers impacts your options. Fill in the gaps with actual REAL data and go beyond the on-line reviews. Repeat customers to your business spend 31% more and will cost 20% less to keep than acquiring a new customer. Evaluation reports provide you the data to help your employees improve the experience.